A smile leapt to my lips. 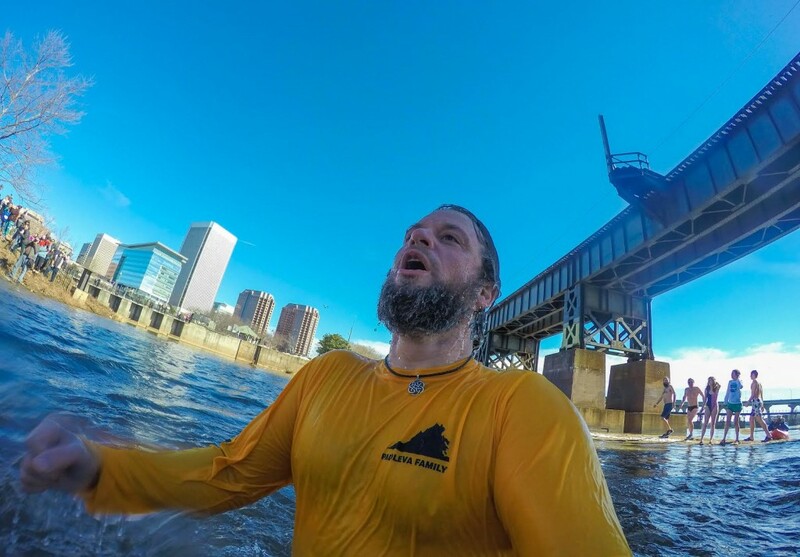 This was going to be a fun day in Richmond, Va.
First up was the 2nd Annual Shiver In The River from 10am-3pm. It’s touted as RVA’s Coolest Winter Festival and raises funds for Keep Virginia Beautiful, which does great work through organized clean ups of our great state, along with other outreach programs. The festival features a Clean Up campaign, a 5K race, and then culminates with a chilly Jump in the James River. Participates who wanted to Shiver In The River have to fund raise at least $75 for the honor. I’d pieced together $155 and was ready to go! Second up was the Coastals : Boats and Brews Film Fest, at 5:30pm, organized by Coastal Canoeists to raise funds for the James River Park System. 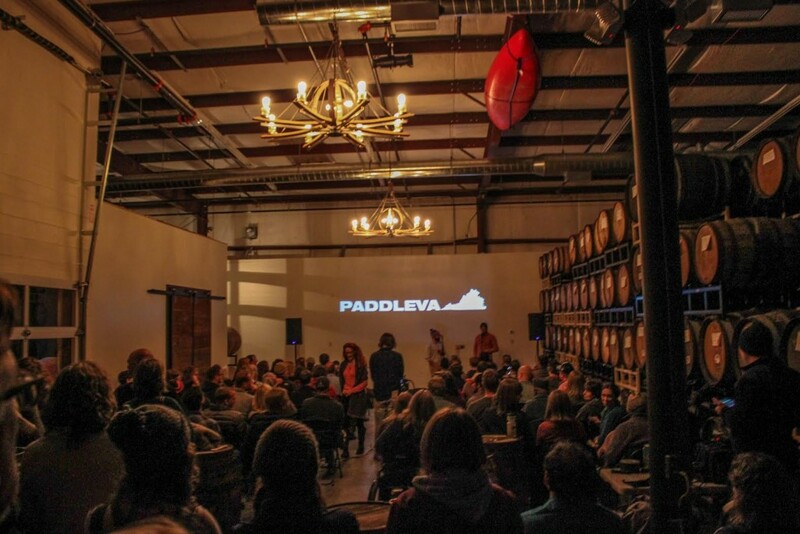 The film fest is held at Hardywood Park Brewery and brings together Richmond’s paddling community for a fun night of beverages, food, and good films. That morning I lit out of Farmville later than I wanted and got into Richmond about 11:15 am. I walked down to Tredgar’s Iron Works and picked up my race packet and fundraising goodies, then hustled to get ready for the 5K race. 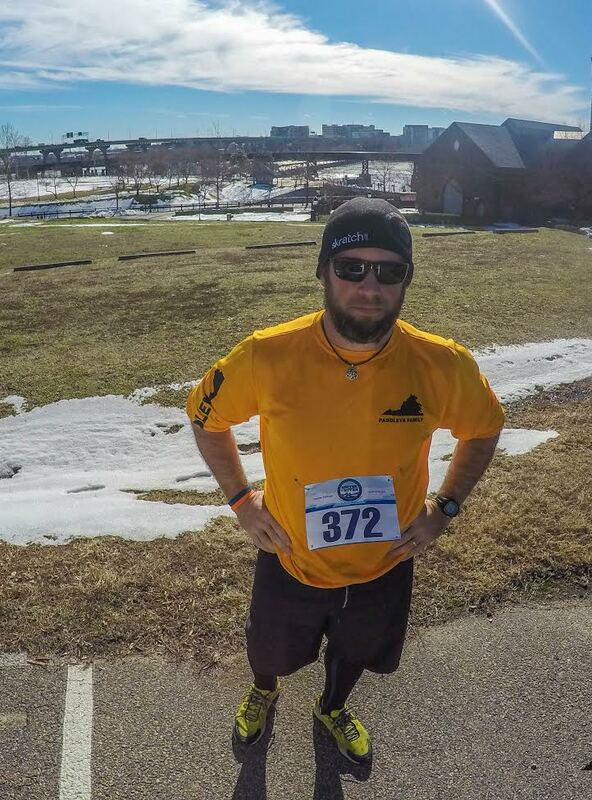 I’ve been training for the Holiday Lake 50K, in February, for about 6 weeks. So I’d been running, but speed has not been a top priority. I was a little apprehensive. Plus, I hadn’t toed the line at a race in years. The last time I’d run in a crowd was April 2015, when I ran 50 miles, off the couch, in a 24 hour Cancer Run. It took my legs 7 months to recover from that. I spent the rest of 2015 focused on kayak fishing. But I determined that 2016 would be different. This year I would run more. Three hundred Shiver In The River runners and walkers lined up at 12 pm, ready for a 5K. The course looped through Brown’s Island, across the pedestrian bridge, across Belle Isle and then back across the bridge to the start. The race organizers warned us that mile 2, around Belle Isle was full of ice. The word “treacherous” got thrown around several times. I slid into the middle of the pack, knowing I was still out of shape. When the race began I instantly regretted my choice. I began weaving, trying to gain open ground, in as gracious a manner as I could. I crashed into a camera man tucked into the crowd within that first .5 miles. When we hit Brown’s Island it opened up and I was able to accelerate. But after crossing the pedestrian bridge, any speed was quickly shut down by the ice. Most of mile 2 was indeed a bit treacherous. But it was my second pass on the bridge that surprised me. When I hit it on the way back, I felt this queasy sensation. My head got extremely dizzy and I almost fell out. I thought something was wrong with me before realizing that the weight of all the runners and walkers crossing the bridge was causing it to sway. None of this seemed to bother the 18 year old kid who clocked 17:31 on his way to victory. Ultimately I finished 32nd overall, and 3rd in my age group. No blistering pace. No award worthy place. But I had a lot of fun, and it felt good to run. Following the 5K, people started to show up, ready to spectate the jump in the James River. I ran into Ryan Corrigan from James River Association, and his wife Mackenzie, down at the ramp and playfully said that I was no longer as excited to jump in. But I was. So was everyone else. Shiver In The River was on! And with that we all plunged in. The shock was real. The water temp was 36 degrees. It was cold. But I couldn’t shake the silly grin from my face as I Ric Flair’ed my way deeper into the water. Wooooo! By all accounts, the Shiver In The River was a huge success in it’s second year. 400+ signed up for the Clean Up at 10am, , 300+ signed up to race the 5K at 12pm, and 200+ made the pledge to jump in the river at 1:30pm. Afterwards the crowd hung out at Tredgar’s and enjoyed music, beverages and food trucks into the afternoon. At this time Shiver In The River looks to have raised over $55,000 for Keep Virginia Beautiful, and while that money will go a long way, it was the smiles in the crowd that seemed to win the day. Good show RVA, I’ll be back to Shiver In The River for sure! In between events, I hit Alamo BBQ and Blue Bee Cidery. These are two of my favorite places in RVA, and must stops anytime I’m in town. The ‘que and the cider are exceptional. Next stop was Hardywood Brewery for Coastal Canoeists Boats and Brews Film Fest. The proceeds from this event go to the local James River Park System, which provides many with an outstanding recreational sanctuary on the doorstep of Richmond’s urban awesomeness. Inside the tasting room, RVA paddlers gathered. The atmosphere was warm with psyche and good vibes. A couple of vendors were on site including our friends from ACA Virginia. There was a small screen in the side room with some tables, and a large screening area back with the beer barrels. Cooper Sallade, local Dagger Kayak Pro, and Ben Moore, local BIC SUP Pro, co-emceed the event and kept everyone engaged between film showings. A crowd favorite, and what I thought was the best film, came from Richmond’s own Tijo Media. It featured the hometown James River in all of it’s seasons, and showed what a glorious resource it is for recreation and meditation. The James River is the vein that pumps life’s blood into Richmond. Once again, I enjoyed hanging with the RVA paddling community. It is a spirited family, intent on celebrating and protecting the resources that feed their passion. Many of the films focused on that idea. It led me to ruminate on why paddlers, hikers, climbers, etc seem so keen to grab the podium and preach about the places we love. 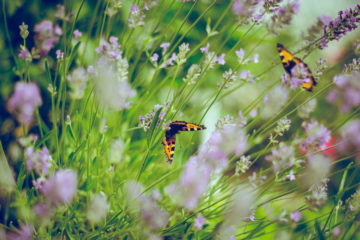 While scientists will give you detailed explanations about the consequences of our actions in relation to our environment, it is the outdoor enthusiast who often times fervently preaches the gospel of keeping that environment clean and all with their dogmatic believe in the therapeutic benefits of recreating in a clean and beautiful outdoor playground. It is that simple idea of play that drives it. We love to play. We love to play outside in beautiful places. These two events, Shiver In The River and Boats & Brews Film Fest, exemplify that passion. I often come to Virginia’s capital for a dose of city culture and to scratch my foodie itch, but this time, I took part in celebrating the abundant outdoor opportunity in Richmond. All day in RVA is darn good either way. Plus I got to race again. See ya out there!